Multicast server is located on 10.1.234.0/24 subnet. It sends the multicast stream using 224.4.4.4 address. Enable multicast on all routers so that. R1 should be the Rendezvous Point (RP) in this network. Multicast server is located on 10.1.234.0/24 subnet. It sends the multicast stream using 224.4.4.4 address. 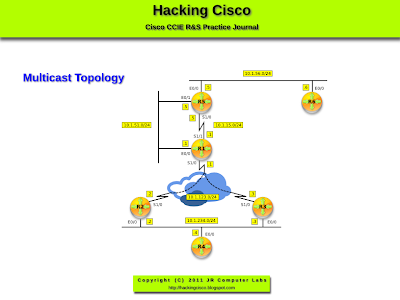 Enable multicast on all routers so that R1 should be the Rendezvous Point (RP) in this network. All routers similar to R1 below (all interfaces are sparse-mode)! Pic. 2 - R1's Multicast-enabled Interfaces. Pic. 3 - R's Multicast Neighbors. All routers know which router is the RP. Pic. 3 - Routers Recognize RP (here: just R4). In order to simulate the client on R6 'ip igmp join-group' command is used. R6 should register the group with RP (172.16.101.1). R5 receives the join 244.4.4.4 message and registers (*,G) entry (multicast) client. Then, DR registers this with R1 (RP). Pic. 5 - R5's Multicast Routing Table Entry for 224.4.4.4. Pic. 6 - RP Registers 224.4.4.4 Client. R4 is sending the traffic towards 224.4.4.4. Pic. 7 - Ping Test.